At Caprio’s Hair Studio we offer many salon treatments including 100% Remy Hair Extensions in the Lower Gornal, Kingswinford and West Midlands area. Since being established in 1998 Caprio’s is proud to be a Great Lengths GOLD Status Salon and specialises in hair extensions. Recognised for our expertise and experience we won ‘Silver Salon of The Year’ for outstanding performance 2014/15 and the following year we had then risen to a Gold Status salon. Our team of Hair Stylists offer a high standard of ladies hairdressing, men’s hairdressing and children’s hairdressing to clientele in Amblecote and the surrounding areas. All our stylists receive regular training in order to keep up to date with the latest and best hair extension techniques in order to provide you with a flawless finish every time. Our Hair extensions can also be used to create more length for hair styles you may want. 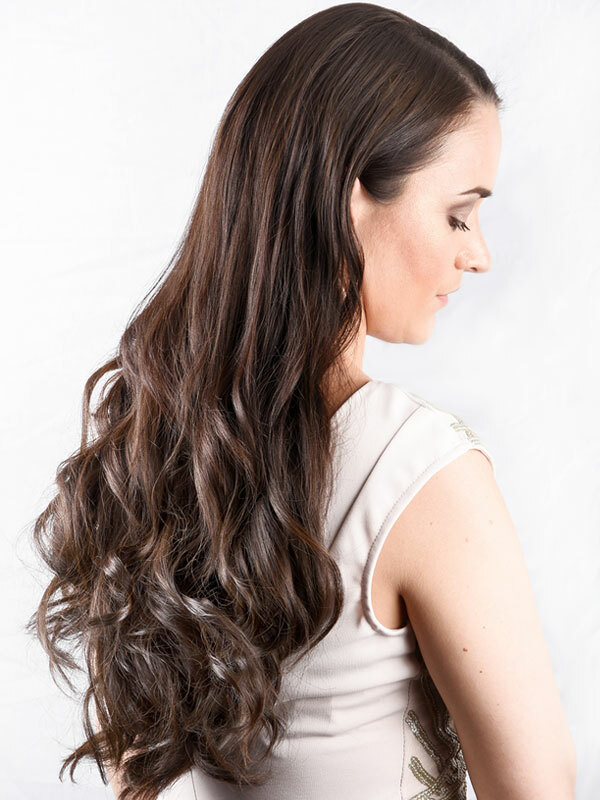 For example we can add length to your natural hair with our Great Lengths hair extensions to then create different updo’s for proms, weddings and special occasions. Great Lengths Hair Extensions have been the world leaders in premium hair extensions for over 20 years. The Great Lengths hair is sourced from Hindu temples where the hair has been donated due to religion. At Caprios Hair Studio we choose one of three application systems when applying hair extensions. The system we use is Cold Fusion. Cold Fusion works by using a single strand application system with small flat bonds and cylinder bonds which in turn gives the hair a natural look and feel. Cold fusion uses unique polymer bonds which are PH balanced and use virtually no heat which offers added protection for finer, heat sensitive hair. It also increases the life span of your hair extensions giving you better looking hair for longer. Great lengths are the only hair extension company to source and produce their own hair. They can confidently guarantee the origin, quality, ethically and traceability of all Great Lengths hair used in a certified salon like ours. As well as this the proceeds from purchasing the hair are then put back into the community to help aid he development of temples, medical services, schools and many other charitable concerns. We believe for hair to look, feel and behave real, it needs to be 100% human hair. Great Lengths only use 100% human hair and that is why we use them to create our hair extensions. We understand every head of hair is different and so is everybody’s lifestyle so we create hairstyles to suit you and your hair. Whether you’ve got hours to spend on your hair or minutes before you rush out the door, we endeavour to tailor your hairstyle to suit. Our stylists will guide you through recreating your style at home and ensure you’ve got the right tools to do so. So whatever style you’re looking for, short hairstyle or long hairstyle, we have the team of experts to help you achieve your desired look.